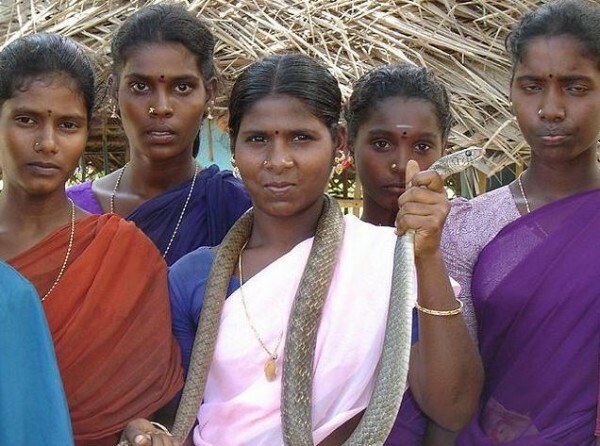 The Irulas are a South Indian tribe who have traditionally based their livelihood on being snake catchers. Up until 1972, they were able to make an adequate living selling snake leather, but with the Wildlife Protection Act India passed that year, their livelihood became illegal. Apparently the Irulas, a minor population of about only 20,000 people, had been so successful in tracking and catching snakes, the government had to step in to prevent extinction of the snakes. When they made the Irulas’ way of life illegal, the government of India promised to ‘rehabilitate’ them into other professions and vocations. Forty years later, most of them earn a living by selling firewood. They have been persuaded to settle down in mud huts and send their children to school, but most of them are not happy with the status quo as it is now. They barely manage to earn a living and the elders and middle-aged people of the community can still remember a more carefree way of life. Living in the forests or on the edge of forests had been their way of life for generations; before the Wildlife Protection Act of 1972, they had managed to have a lucrative trade as snake skins were considered exotic and thus expensive. A very few of this community however, still manage to continue their traditional way of life, albeit they catch the snakes, but don’t kill or skin them. They have been enlisted by the government to catch the snakes so that venom can be milked from them to make antivenins. An estimated 40,000 people die of snakebites in India every year. The project was the brainchild of herpetologist Romulus Whitaker and is much lauded for utilizing the traditional skills of the Irulas. Whitaker who established the Madras Crocodile Bank in 1976 to conserve several species of crocodiles, also hosts the venom milking centre within the bank’s premises. Rather predictably, the men who worked among the snakes quickly became a star tourist attraction at the bank. They do it so nonchalantly that the tourists are lulled into a sense of normalcy too. One had to remind oneself that the men were standing in a pit filled with hundreds of poisonous snakes and that was not normal. For the men however, it is in every way normal – their way of life as they have traditionally known it. Instead of the tribal attire of their ancestors, they wear khaki uniforms complete with black boots and white gloves, but a question put to them on whether they were not afraid of all those poisonous snakes causes a ripple of amusement amongst them. And so the men stand in a pit crawling with hundreds of snakes for more than eight hours a day, completely nonchalant about it. There is an ambulance on standby to rush them to hospital should they be bitten. However, the Irulas, who have traditionally survived over the years using their own form of herbal medicines, keep a supply of those herbs handy as well. Most of the men go quietly about their work, but one of them, Kannan, has reinvented himself as something of a tourist guide and entertainer, in addition to carrying out his job of milking venom. He is quite witty and entertaining in his own language, Tamil, and manages to communicate adequately in broken English with the many foreign visitors. “This no baby. If it bites you die, two days,” he says to a Russian tourist, holding up a Saw-scaled viper, attempting to explain that the two inch worm-like creature is a full grown snake. Saw-scaled vipers are the smallest of the lot; the other snakes are all quite long and frightening. According to Kannan, a person can die within one hour of a Krait bite; three hours of a Russells Viper bite; four hours of a cobra bite and two days of a Saw-scaled viper bite.